Some may argue the greatest dip in the world is a great big bowl avocado salsa or chunky guacamole. We agree. What’s not to love about the mix of perfectly ripe avocados, sweet diced tomatoes, spicy red onion, and tangy fresh lime juice? 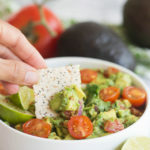 Whether you are using this avocado salsa recipe as a dip, topping, or even eating it by the spoonful, the blend of these textures and classic Mexican flavors will probably have you licking the bowl clean. Most people on a ketogenic diet are familiar with eating ripe avocados. They are extremely rich in vitamins, minerals, fiber, and healthy fats, but still low in net carbs. You can certainly eat them right out of their skin, but something magical happens when you add a little bit of fresh lime juice to ripe avocados. The unique acidic flavor found in limes provides an extra layer of depth, freshness, tang, and completely elevates everything it touches. An added bonus of using fresh lime juice is you get all of this extra flavor for not a lot of extra calories or carbohydrates that can kick you out of ketosis. Not only that, but using freshly squeezed lime juice also has some other unique health properties. Limes are loaded with antioxidants and Vitamin C, which help fight infection and disease. These nutrients help neutralize free radicals, protect immune cells, ward off infections, and can even shorten the duration of common colds. Fresh lime juice and lemon juice provide a ton of flavor, but are also low in calories. Instead of drinking soda and juice, trade those carb filled drinks with some fresh citrus water. Some studies have even shown that limes could help reduce body weight and boost metabolism. Adding fresh lime juice is one of the easiest ways to combat kidney stones. They contain citric acid, which increases urinary citrate and urine volume to help break down these mineral deposits and decrease your chances of developing kidney stones. Enjoy this recipe as a dip, topping for taco lettuce wraps or grilled chicken tacos, or even stir in canned tuna for a high protein keto friendly meal. All you need is some freshly chopped ingredients, a mixing bowl, and a spoon. One taste of the burst of flavors and textures in this avocado salsa recipe will have you hooked. Add all ingredient to a medium bowl. Stir well to combine. Adjust seasoning as needed to taste. Recipe can also be made in a food processor. Add tomato, small onion, cilantro leaves, lime juice, salt, pepper, garlic, and jalapeno to a large bowl of your food processor and pulse until desired consistency. Carefully remove blade and stir in chopped medium avocados. Adjust seasoning to taste. Serve immediately or cover with plastic wrap and store in the fridge. If you prefer a smooth dip or want to transform this into a creamy avocado salsa dressing, simply add all of the ingredients to a food processor and blend on high until desired consistency is achieved.